Combining well established genres in the pursuit of a new and fresh sound is usually a bit of hit or miss. Either it becomes inspiring and effectively brings the better of two worlds together or it becomes a weird mesh without proper direction. 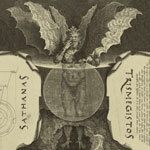 On their sophomore album 'Sathanas Trismigestos' Head Of The Demon has brought together the slow repetitive psychedelic landscapes of doom metal and the aggressive darkness of black metal. Hit or miss? Definitely the former. The foundation of this album are the repetitive doom-riffs serving as the core of each song. Only by varying the arrangements slightly and adding equality repetitive vocal lines every now and then does the band achieve enough variation to keep the listener's interest. If the foundation is purely doom metal, the added arrangements and vocal lines draw their primary inspiration from 80's black metal bands such as Celtic Frost. The result is a dark and hypnotic creation that bears that psychedelic touch that is so popular among retro metal bands such as Ghost these days. The songwriting is carefully crafted with both finesse and skill and in songs 'Maleficium' and 'L.L.L.' it is impossible to not get totally absorbed by the atmosphere. Doom metal is usually a genre whose appeal tends to go me completely by, but 'Sathanas Trismigestos' are one of the few exceptions where even yours truly can stand nearly 50 minutes of slow repetitive riffing. For those who worship said genre and does not shun a fair bit of black metal influences I guess this is a much recommended listen.